Strapping in behind the wheel of a beefy all-terrain vehicle lets you explore more by opening up areas off limits to lesser vehicles. Russian adventure company TechnoImpulse specializes in constructing the type of brawny explorers built to expand your horizons, and their Rocket Z is primed to do exactly that. Round up a small group of nine ramblers and hop into this 4×4 beast that’s powered by a 100-hp turbodiesel engine. 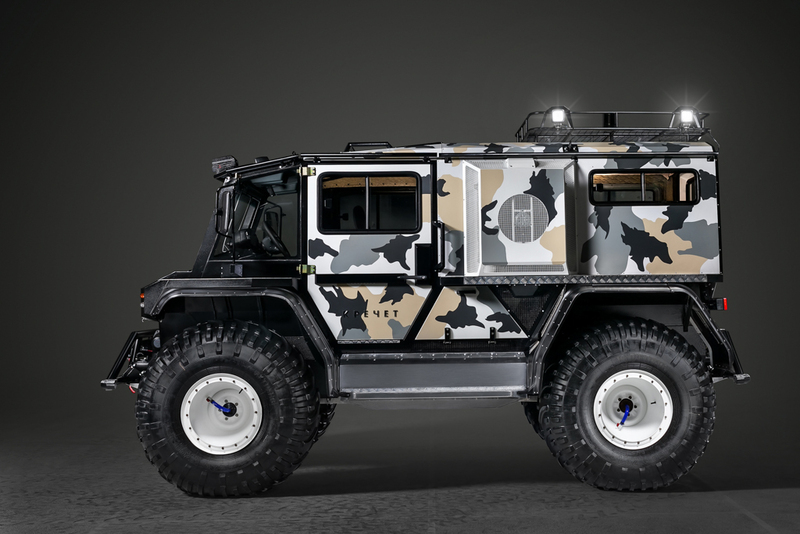 The off-road brute is equipped with ‘Hella’ optics, power-steering boosters, ‘ComeUp’ front winches, and a tow bar. It also features a spotlight finder, Hella Xenon lighting on the roof, and cross wheel limited slip differentials. Whether you’re storming through a forest, delivering a payload in snowy terrain or inspecting oil pipelines, the Rocket Z 210-91 is ready to perform. This is the all-wheel-drive camo adventure vehicle you need to take on the most challenging road conditions with ease. And don’t forgte to check other all-terrain beasts: Rezvani Tank and Rhino GX.